Over the past few days, Dayasiri Jayasekera and Deputy Minister Ranjan Ramanayake engaged in a war of words over this matter. According to UPFA MP, Dayasiri Jayasekara, he was elected Chief Minister of NorthWestern Province in August 2013 and noted that he was not an MP when the incident took place. Dayasiri reminded the public that he functioned as the Chief Minister until the elections were held on the 17th of August 2015. He went on to state that nominations were called on the 5th of July 2015 and on the 13th of July he submitted his nomination. Deputy Minister of Social Empowerment, Ranjan Ramanayake states that the cheque was en-cashed on the 04th of June and Dayasiri Jayasekera said he obtained support for the elections. He stated that Dayasiri had said they were business associates. Furthermore, Deputy Minister Ranjan Ramanayake said that the cheque was given to Jayasekara during the transition period between the Presidential Election and the General election, Ramanayake also accused Jayasekara of accepting money from the same sources to fund the campaign for the North Western election as well. Responding to these allegations MP Dayasiri Jayasekara stated when the matters relating to the Bond Scam were being investigated in COPE he could have undermined the investigations but did not, he went on to state that Arjun Aloysius had given money to 118 other people and those 118 people need to be looked in to. Further Deputy Minister Ranjan Ramanayake said that MP Dayasiri has no right to speak about fraud and corruption. Ramanayake says that Jayasekara should return funds from the bond scam to the treasury before speaking on these issued. Evidence at the Bond Commission revealed Arjun Aloysius had spoken to several members of the Parliamentary Committee on Public Enterprises during COPE hearings. Aloysius had spoken a total of 227 times to Minister Sujeewa Senasinghe, 18 times with Dayasiri Jayasekara, 176 times with Harshana Rajakaruna and 73 time with Hector Appuhamy during periods commencing January 2015. Dayasiri Jayasekara had also been in communication with Arjun Aloysius with 18 calls going to and from him with Aloysius in total, with two calls during the period of the COPE hearings. The communications with Jayasekara had commenced on July 10, 2015. The second Committee of Public Enterprise (COPE) was established on May 6, 2016 to investigate the controversial Bond Issuance. MP Ajith P. Perera had only two calls, one incoming and one outgoing, between him and Aloysius. The total number of Telephone calls to and from Senasinghe to Aloysius between the periods July 4, 2015 to March 3, 2017 was 227. They include calls on other platforms such as Whatsapp and Viber. Harshana Rajakaruna who was also a member of the COPE had a total of 176 calls between each other and 18 during the period of the COPE hearings. Evidence before the Bond Commission revealed that former Finance Minister Ravi Karunanayake and his family spoke to Arjun Aloysius over 750 times in total during the period February 5, 2015 to June 20, 2017. The claims made by MP Dayasiri Jayasekera, stating 118 people had dealings with those accused of committing the Central Bank Treasury Bond Scam, have raised questions from different factions in the political arena. Minister of Petroleum Resources Development, Arjuna Ranatunga stated that he personally thinks that if there are 118 names, all of the names should be revealed as it will help the people to understand the real situation. He added that if there are 118 as alleged, the President and the Prime Minister should ensure that those behind this are brought to light and exposed. 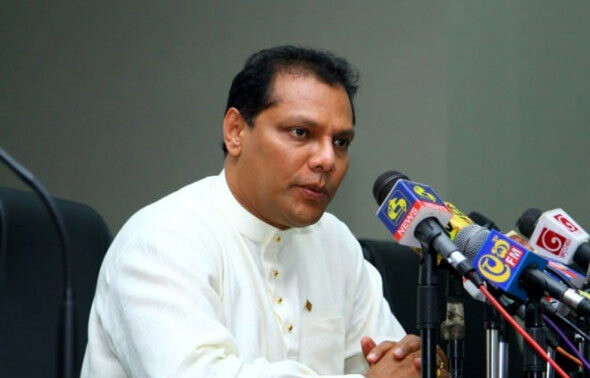 UPFA MP Shehan Semasinghe believes that Dayasiri Jayasekara’s statement about 118 politicians being involved is unfair as the people could speculate who from amog the 225 MPs are involved. He said that just like Dayasiri said that he accepted money, if he alleges that 118 others took money, he has a responsibility to reveal them. Now that we all know you are in Aloysius payroll, if you have any juice remaining, table the list of remaining 117 legislators who are in Aloysius payroll in Parliament. We, the people of Sri Lanka, are ready to show this gentlemen and ladies, the backdoor at the next elections whichever political party they belong. The Late Ven Sobitha Thero caused a bloodless revolution on Jan 08, 2015 by dismissing an overly corrupt, genocidal regime with a common candidate. The victorious common candidate however turned out to be just another inept, corrupt and power-hungry individual who has, with wilful intent, let down the voters of this country in the 3 1/2 years. You could lead Stage 2 of the Jan 08, 2015 revolution by tabling the list of 117 parliamentarians who ate the taunted money of Aloysius Mudalali. Dayasiri, if you table the list of 117 Aloysius Mudalali’s Bum Suckers, we will forgive you for being one of them.